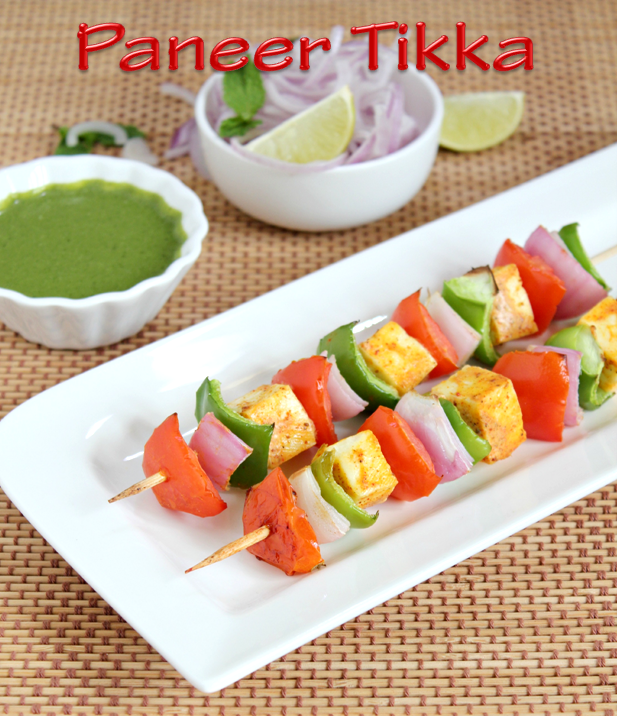 Paneer Tikka is a must-have at our dinner outings.I am sure most of us like it(especially the kids).I made it at home and it is surprisingly a simple recipe with out any great efforts. It can be made in the oven,on the stove top or in a Tandoor. It tastes great any way.The traditional recipe is a little smoky and black(around the edges).We do not like it much so I have altered it to suit our taste buds. 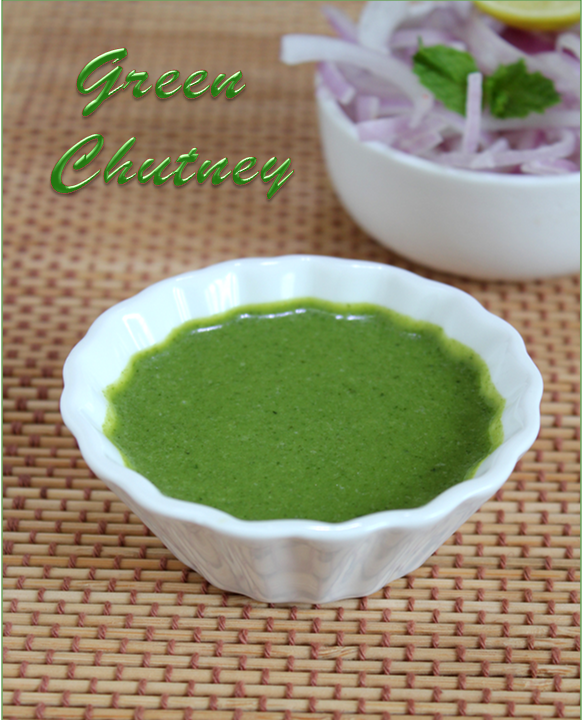 It tastes yumm, especially with the green chutney - which my kids made. Grind all the above ingredients to a smooth paste.You can add curd if you wish. 1.Soak the skewer sticks in water to protect it from burning or turning black.Cut the paneer in to medium sized blocks.dice the onions,capsicum,tomato(remove the pulpy part ) into same size as the Paneer. 2.For preparing the hung curd hand half a cup of curd in a muslin cloth for an hour.Mix the sour cream or hung curd with salt,turmeric,chilli,both masalas,lime juice and mix well. 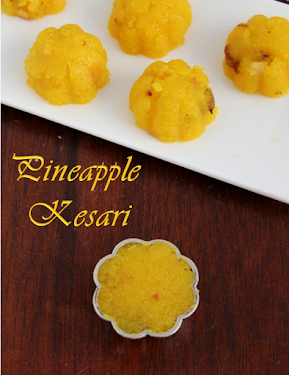 3.Marinate the paneer blocks with the above mixture and leave it in the refrigerator for half an hour. If you want, you can marinate the vegetables too. 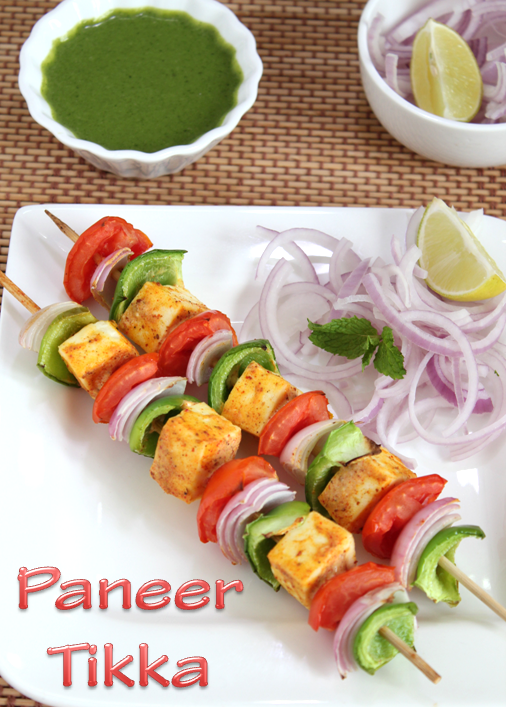 4.Arrange the paneer and the vegetables in the skewer as shown in the picture. 5.Preheat the oven at 230 degrees and bake it for 12 minutes or until the edges of the Paneer becomes brown. We do not like the smoky taste too much, so mine has not turned black at the edges (like the ones in restaurants).We all like it this way so I stopped baking further. If you like it smoky, bake it further for few more minutes. If you are making on the tawa heat the tawa spread few tbs of oil and shallow fry the tikkas with vegetables in the skewers.Turn on all sides and fry uniformly until required. After baking sprinkle chat masala powder and lime juice on top and serve with green chutney and some onions. I want to teach my 12 year old to cook. Any recipe ideas... Make it easy hope fully not over a flame but it's ok... Thx! Wow, yummy looking.. where do you buy wooden skewers in chennai?